We want to be a Pokemon Ranger and live a life of danger. When it came out last year, Pokemon Ranger presented an interesting new twist on Pokemon games and how we played them, putting us in a more active position of circling Pokemon characters with the stylus to capture them and then utilizing their talents in times of need. Now the Ranger series is poised for a comeback with the forthcoming sequel Shadows of Almia, set to hit shelves this November. As expected, you're back to full Ranger duties in Almia, once again setting out on a quest to capture Pokemon and use their skills to battle and protect fellow Pokemon in your region. You begin as a basic Student Ranger, earning your stripes by capturing your first Pokemon and working your way up. There are numerous Ranger rankings available, the highest being the Top Ranger. 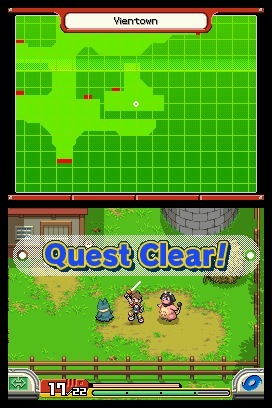 Along the way, you'll capture numerous Pokemon using the same stylus-circling techniques from the first game. A Pokemon will run around on-screen and you'll have to quickly draw to capture it. Once you do, you have the ability to use that Pokemon in a future battle, but you'll have to set it free afterwards. Not to worry, as there are dozens of Pokemon throughout the game, and a Pokemon partner stays by your side no matter what happens. Furthermore, different Pokemon come in handy for certain puzzles or battles, like calling on Pikachu's electrical powers to counter a water-based Pokemon. Better still, your Capture Styler becomes stronger with each new Pokemon you capture, resulting in your ranking-up in Ranger status. You'll need this strength, as you'll encounter stronger and wilder Pokemon later on in the game. Shadows of Almia features hundreds of varieties of Pokemon, including new characters that were introduced in Pokemon Diamond and Pokemon Pearl. Just like the first game, you'll also be able to choose between male and female characters. Best of all, Almia is a far more expansive world than the one introduced in the original Ranger. There are more missions available, along with several side tasks and places to locate and capture untamed Pokemon. Some require you to travel through hot scorching deserts, while others take you and your partner Pokemon into the forest. There's a lot of ground to cover in the game, and you can save your progress at any point if it's too much to take in at once. Pokemon Ranger: Shadows of Almia doesn't change the formula that much, but considering how well the first Ranger worked, it doesn't need to. It provides a fun hands-on approach to capturing Pokemon, allowing you to use their powers without abusing them like Team Rocket. Apply for your Ranger badge when the game arrives this November.